Last week Digidoc 12 was held at the Royal College of Sugeons’ Hall in theatrically mist-filled streets of Edinburgh Scotland. Over 200 people from the UK, USA, France, Germany, Italy, Australia and South Korea attended our event. This year’s conference had a diverse collection of presenters, dealing with such topics as character animation, software development, hardware design and most certainly, virtual heritage preservation. "I specifically want to mention our partners CyArk, and Ben Kacyra who is with us today. CyArk was born out of a desire to document heritage sites for the future and to share the excitement that Ben felt as a young boy in Iraq as his father walked him around the ruins of Babylon. Like many good ideas it needs someone brave to step outside the box and relentlessly drive their vision. Ben stepped outside the box, set fire to it, and has spent the time since getting other people to pay for his dream! Those of you who know him know that his enthusiasm and passion are hard to resist and he is the primary reason Scotland embarked on the Scottish Ten project. As CyArk continues to grow and its reach spreads, many other countries are seeing the benefits that Scotland has. I am therefore delighted to tell you that CyArk has decided to establish CyArk Europe in Scotland which will serve Europe and the East and has appointed Doug Pritchard as Director for Europe. This is a mutually beneficial relationship and I am very pleased that CyArk felt Scotland was a natural home for expansion." 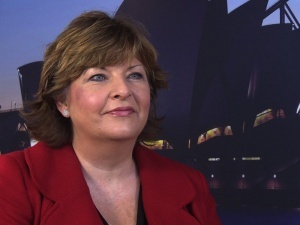 Fiona Hyslop then made the first public announcement of the next Scottish Ten site at the Sydney Opera House in Australia. "I am delighted that the Sydney Opera House Trust and the Australian Government have so enthusiastically agreed to participate in this project. I am pleased to have met representatives from Australia this morning and I am greatly enthused by their commitment to the project. There are such an array of positives around this project and I know the collective teams are very excited around the potential of what can be achieved here. We hope to undertake the site work during 2013 and we shall focus our time on site in documenting the exterior surfaces of the building before moving to the main auditorium. It is remarkable to think that collectively we will create the first ‘as built’ documentation for the site which will become a very much live tool for the conservation management and planning for the building, and to aid interpretation and understanding." The first speaker was Gordon Cameron, Technical Supervisor of the Pixar movie Brave. The ex-Scot now living in California, described the fascinating methodical process by which Pixar created the 3D characters, in particular Merida’s hair and the natural environments in Brave. Gael Seydoux from Ubisoft presented the theory and development process behind the Assassin's Creed video game series. He emphasized that although his company strives for visually accurate characters and historic surroundings, the impression of historic settings are more important than actual dimensional architectural accuracy. That being said, 15% of people who have purchased Assassin's Creed do so because of the visually engaging environments. Anthony Geffen, CEO of Atlantic Productions in London, presented his company’s recent portfolio of 3D-filmed documentaries. He described the arduous technical approach required in their creation of ‘The Bachelor King 3D’ and ‘Kingdom of the Plants 3D’. He also touched upon the technology behind their upcoming film ‘Galapagos’. A palaeontologist from Lake Turkana Kenya seemed like an odd fit at a predominately technology-based event. Louise Leakey spoke of her family’s work in the Turkana basin but then went on to describe her use Autodesk’s 123D Catch and rapid fabrication technology to bring her fossil discoveries to the world digitally. Adam Metallo and Vincent Rossi from the Smithsonian Institution, Washington DC presented ‘How do you scan 137 million objects?’. Their challenge, to use the latest 3D captures technology to document the vast Smithsonian collection of artifacts. Similar to Louise, bringing a virtual collection to the world via the web. The last two speakers on the first day were Paul Bryan, Geospatial Manager from English Heritage and Dr. Phillip Lindley, Principle Investigator from the University of Leicester. Paul presented the results from English Heritage ‘s recent Stonehenge documentation project. He described the exceptionally thorough process that was used in the 2011 laser survey. Phillip demonstrated his research in the documentation and virtual reassembly of Renaissance Monuments. The end of the first day was followed by our famous (perhaps infamous) conference céilidh (a tradition Scottish social gathering), this time held at the magnificent Edinburgh Castle. Ian Walford, Chief Executive from Historic Scotland welcomed all the delegates and guests. People then diligently lined-up for the whisky tasting, and then attempted a bit of traditional Scottish dancing. Most certainly, no one left the castle bored that evening. In front of a slightly subdued audience on the second day (see above), Joseph Chumbley described his exceptionally precise work and technical methodology at the Lockheed Martin Space Systems in Denver Colorado. He was then followed by Lourdes Cerezuela, a young architect from the Polytechnic University of Valencia, who presented her work on the digital preservation of San Sebastian church in the Philippines. David Mitchell, Director of Conservation at Historic Scotland and myself provided an update on the ongoing Scottish Ten project. So far, 4 of the 5 Scottish UNESCO sites and 2 of the 5 international sites have been fully documented. The main focus of our presentation was on the projects that are scheduled to occur over the next 6 months. Specifically the technical challenges of documenting the Eastern Qing Tombs in China and the recently announced Sydney Opera House in Australia. Our presentation was then followed by a fascinating presentation by Greg McTaggart, Director of Building Development from the Sydney Opera House. Not only did Greg touch upon the history of the iconic structure, he also presented the rationale of why the Opera House requires a precise 3D digital representation. The next session had Dr. Christian Hesse from Dr. Heese un Partner Ingenieure in Hamburg Germany and Neil Tocher COO of NCTech Scotland. Both presenters demonstrated their latest hardware designs. Christian demonstrated their new portable (body-mounted) terrestrial scanning rig and the production benefits behind its use. Neil then spoke about the technical background behind their new and highly desirable iStar 360-degree camera/video system. A welcome addition to the terrestrial scanning system. The last two speakers of the conference were Bruce Dell, the Founder and CEO of Euclideon Australia, and Greg Downing from xRez but representing the GigaMacro technology. Bruce demonstrated his incredible Unlimited Detail point-cloud engine, a game changing technology worth keeping your eye on. Returning from last year’s Digidoc, Greg presented the GigaMacro system – an advanced macro-SLR camera rig that creates gigapixel imagery of macroscopic and microscopic objects. With this year's event now over, I am very happy to report that the reviews from the speakers and delegates has been universally positive. We received particular praise for the variety of speakers, the uniquely Scottish social opportunities and similar to last year, the outstanding organisation skill's of Historic Scotland's Dorothy Hoskins, Hazel Johnson and Vanessa Gonzales. I would also like to thank all the conference exhibitors - Maptek, Survey Solutions, Spheron, 3D Laser Mapping and Z+F UK for their support. I would also like to particularly compliment the Leica Geosystems UK team for co-sponsoring our event again this year. Thank you once again for an inspiring conference held in such a wonderful setting, the highlight being the evening at Edinburgh Castle, we experienced the best of Scottish hospitality. The selection of speakers was excellent, and the event provided such a valuable insight into the importance of the work to preserve our heritage and the need for good technology. 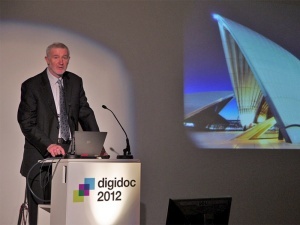 I left Edinburgh wanting more and look forward to Digidoc 2013.